There is little doubt it’s time to think about the meat we eat. How we use the animals raised for consumption. How we treat them. How they are butchered. And how the whole beast is used to feed our families. Stories of meat tainting and commercially farmed animals in hideous circumstances are far too common. Wouldn’t it be better to celebrate the appropriate, thoughtful consumption of meat with a year long exploration of the age old craft of charcuterie? We want to make it easy and fun to participate. If you are in, send me a message using the contact form on this blog. Include your name and your blog address. 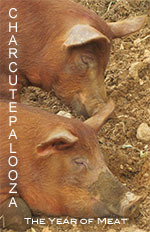 Everyone participating will be listed (with links) on a page linked to www.charcutepalooza.com. If you don’t know where to hang meat in your studio apartment, don’t worry. There will be plenty of projects that do not require hanging meat. Duck prosciutto aside, each month’s project will be crafted with a wide range of applications in mind. We’re using Charcuterie: The Craft of Salting, Smoking, and Curing as our guide. Michael Ruhlman has said he’ll be involved. More on that soon. Already it looks like an amazing community of talented cooks will be involved. Watch for posts from GlutenFreeGirl and The Chef, Last Nights Dinner and A Dash of Bitters, Heathy Green Kitchen, TasteFood, The Peche, NotDerbyPie and Hedonia, to name just a few. If you’re not a blogger, you can still participate. Post your experiences on the round-up post in the comment section, and share photos at our Flickr site. Or just read along and watch what happens. I’m hoping for a few good stories. Hang on to your hats because there is more to come. Punk Domestics wants to run with this, showcasing blog entries from our Charcutepalooza. And Kim and I are brainstorming all sorts of fun and games. More on that later. For now, let’s get on with it. Let’s celebrate the age-old talents and skills of charcuterie with contemporary takes on techniques, flavors and presentation. Let’s agree to use humanely raised meat, sourced as close to home as possible. Let’s write about our experiences. Not just how the charcuterie is made, but how we use it, serve it, flavor it. Buy a copy of ‘Charcuterie: The Craft of Salting, Smoking, and Curing’ by Michael Ruhlman. Cook along as often as practical. There’s no obligation. Post about your experiences on the 15th of the month. Please, let’s not post the charcuterie recipes. However, recipes that use what you’ve made – that’s what we hope you will post. And presentation. And the photos. We know we’re going to love the photos. I’ll post a monthly charcuterie challenge on the 15th of each month. This will kick off the project and offer some tips for success. You’ll have one month to complete your take on the challenge. Kim will post her take on the monthly challenge on the 15th, also. She’ll be addressing the charcuterie from her never-done-it-before point of view. We hope our two perspectives will give you plenty of help and information to get on with some meat-making. We’re also hoping to get some expert help at a monthly twitter talk. More on that later. We’ll post a round up of links on the 30th of each month. If we can find some sponsorships, maybe we can figure out some contests or giveaway. More on that later. And each month, Kim will post her experiences, as a newcomer to meat-crafting. I can’t wait to see what she will get up to. Last I heard, she was looking for nightclothes for her duck breasts. No, not kidding. We’re terrified and thrilled to set off on this project. Can’t wait to see how the charcuterie is served in your homes. Charcutepalooza. The Year of Meat. Update: Throughout the year, you’ll find all the challenges here. Let me just be the first to say…The Year of Meat is going to rock. Bring on 2011, a happy, healthy New Year, and Charcutepalooza, baby. So excited! I am taking the temperature of our garage as I type this in preparation for the duck! You certainly piqued my interest as I was vested in the search for cheesecloth and can’t wait to see the comparison between it and a nightie Kim. Understanding that ‘nighty’ in this house is sweats. This is the BEST new project EVER! You need T-shirts AND aprons AND trucker hats. This is quite a movement, people! Quite! Hats off to you! BTW, J won’t let me hang the ducks in the handbag/shoe closet, no matter how fashionably I dress them. Year of meat! Yeah! This is going to be fun! I’ve met Ruhlman and Charcuteire is autographed to me. We fed him lunch and I made a pate. I’m in! LOVE this idea!!! I’ve been watching the #charcutepalooza discussion so far on Twitter and I’m intrigued. I’ve never done anything like this before either, but since my husband is super-keen for anything that involves meat, it should be an adventure to look forward to. I hope we make it through the first challenge! You had me even before you mentioned Duck Prosciutto. Great idea! This sounds like so much fun! Ironically, I started reading Charcuteire this last week as understanding this craft is a sort of culinary new years resolution! Count me in!! Great idea!! What fun! I’s definately buy and apron too! Would love to be involved – but being the above-mentioned owner of a city studio apartment, will have to keep track of all of your adventures and when I see my moment jump in! Good luck to you all! I am also going to be in France the last week of January and plan to take lots of pictures of charcuterie there for comparison sake. I am so in. My middle name is meat. Sounds fantastic! Can’t wait to learn! Count me in! Oh, what the heck. Count me in! I have no blog, but I’m in!! We have been doing something similar over at Meat Club Charcuterie. I’ll repost as some of our readers/group members may want to participate. We have had a lot of fun and learned a great deal. Sounds like you will too! Alright, I’m in. I was worried I’d have to commit each month, but I see I don’t have to do that. I’m not sure I’ll be doing the first month’s, as our budget is tight and we’re trying to live out of our pantry this next month, but I’m game for trying some of these. Also, is it permissible to use the book from the library? I really, really can’t afford much new right now. Our library does have the book, though. The Year of Meat! I look forward to a tasty 2011! Cathy, you rock! count me in too! i’m a little scared and a lot excited to try this! we’ve got great sources for humane, ethically raised meat here in seattle, so let the charcutepalooza begin! Meat – of course. The Perfect year ! I’m not sure I’ll get involved in anything like duck, but I’ll definitely try and join in with some of your pig recipes. Am excited to participate in your project, sounds like very much fun. Starting right off with Duck Prosciutto! Okay, this is just the kind of project that really “floats my boat” (do people say that in America?). Anyway, I’ve been doing a lot of “reappraising” of my blog over the last few weeks, and really want to participate in events which are more educational than just glorified “recipe swaps”. For me starting my blog was in large part about educating others and at the same time stretching my own culinary boundaries, so I would love to participate in this. Guess I will have to wait a few months to try making the duck breasts though, as right now it is summer where I am and there is no cool place to hang up my breasts. By about May though the ambient temperature in my apartment should be just about right! – no garage needed!! Look forward to joining in with the next challenge. In. Love this idea. I have been working on covnerting an old fridge into a curing chamber. I’ve aslo been reading Rhulman’s book. Very excited to give this a try. Bought the duck today. It was frozen and expensive. yikes. Duck is hanging. I’m in. Yes! My last charcuterie project involved hanging chorizo to dry in my bedroom, which was both hilarious and tasty. Looking forward to picking up tips from other apartment dwellers on drying/curing! You guys are all doing God’s work! Onward! Picking up my hoof on pig leg from Buku Farms this Saturday (Detroit Eastern Market) to make prosciutto. Would love to participate!! I’m a late as well, but I’d love to join in! I went and bought Ruhlman’s book (it was on my wish list, anyway) and I’m ready for some meat! I’m a bit confused about the duck prosciutto, does this mean that it needed to be done by the 15th? So if we haven’t started that, we should just wait for the next one to join in? Ahh, never mind, I see it’s an 8-day project so I could potentially still squeeze it in. I’m in the process of moving to a new house which has a little crawl space in the basement that I think will be perfect, can’t wait to test it out! I love a party! Count me in! I have made pancetta– and some headcheese– want to do more. Living in Italy I have access to great products here- but as a cooking teacher like to teach others too. Practice makes perfect! I’m so IN on this!! Skipping January because life is crazy, but am excited to get started next month! Alright! Meat. Salty pig parts. Oh, wait, it starts with duck. Hmm, well, I’ll join in next month, there’s no way I can get duck in time unless I go grab one from the neighbor’s duck pond and do a quick sacrificio. Bu they probably wouldn’t appreciate that. Living in a condo in Florida, I’ve no place to cure, but I’ll definitely jump in on the projects I can do. Looking forward to reading everyone’s blogs this year! This interests me greatly but before I buy Charcuterie I need to know; as a home cook who has limited access to meats outside of a supermarket, what could or would be the dangers in my curing meat at home? Listeria…unwanted airborne contamination….are just a few of my novice thoughts on ‘can this happen’? My storage facilities are minimal and have no cold storage outside of a fridge…can I still participate? My first ever ‘cured’ anything was when Mr. Ruhlman did a salmon and I followed the recipe…I had such surprise and pride eating it that it has become a staple in my house. Charcuterie is such a broad category, Natalie, challenges will cover all sorts of product, only some of which are cured. I hope you are able to source pastured, humanely raised meat, rather than depending on your supermarket. The difference is dramatic, in so many ways. Oh this is a fabulous idea. I am so in. I don’t have a blog but this is going to be great. My wife and I are remodeling our garage to make and sell sausages, hams, bacon and salami, Got Ruhlmans book, Brain P. and the Ruhlman did a great job. Can’t wait to follow this. Wow! This sounds amazing! Count me in. If it’s to late for this month I’ll for sure participate in future months! I won’t be able to participate, though I may have to make a few of these “side projects”, but what a great idea! Best of luck with Charcutepalooza 2011. I am already working my way through Charcuterie (just over half way). I’d love to join in here. I may do some alternatives if y’all repeat one that I’ve already done. And while I /have/ done the Duck Prosciutto (oddly enough it was my first item out of the book), I will be making the trek this afternoon to pick up a nice fat duck to use (and save the legs for confit…). Team FoodieLawyer is in! We picked up a copy of Ruhlman’s Charcuterie yesteraday, and we’ll be duck shopping tomorrow. We’re on the road until January 21st – but, since I have made duck prosciutto before, this will be o.k. to get in the last minutes. this is such a fun sounding year long project – so glad I was told about it. Judy Witt Franchini told me about this…I interested…If I miss the duck this month can I join in next month?? There’s no obligation to do every challenge, but we hope it will look like so much fun, you wouldn’t dream of missing it. Great idea! My book won’t arrive in time for the first challenge, but I’m looking forward to Februrary. Love to participate! We’ve been talking about a smokehouse for a long time. Maybe I can even get my husband involved! This is great…I’m so looking forward to it. This is fantastic! I started the project to work through Charcuterie about a year ago and recently completed my curing chamber which i blogged. I can’t wait to begin curing with you guys! 2011 is definitely looking up already! Brilliant idea! We have been meaning to do this for at least a year. This is good motivation to actually do it. Looking forward to tagging along. Cheers! We just started raising heritage woodlot pork in Middle Tennessee and are very excited to learn about the best ways to preserve this lovely meat. We are looking forward to all of the creative posts and ideas that come about as a result of this challenge and LOVE the promotion of humanely raised farm animals! I’m in! Fantastic idea for 2011. Have 20 pages to finish reading Ruhlman’s great ‘Making of a Chef’ and then crack open ‘Charcuterie’ tonight. I’ll be behind on the duck prosciutto, but I’ll catch up! (PS; I’m an Irish guy who grew up in an Italian neighborhood on Long island where many made their own Salumi, Sauces, Wines, etc. totally from farm to table) Can’t wait to get going! I am in…been working through some of the stuff from the book already…mostly fresh sausage, corned beef, and kraut plus a few others. Definitely want to dive in and wouldn’t mind having others in the same pool – makes questions and answers more pertinent. Bonus is Michael will be on board giving some insights. I know he has answered me personally but I’m sure he’s a tad busy and having him chime in rather than answer individually might be a better use of his time. Scott, you might want to jump in to the Twitter pool, too. The #charcutepalooza hashtag is going all day and night — great information sharing. Thank you for replying to my previous post. I think I accidentally deleted the post when I wanted to reply. Sorry about that. We took your advise and tasted our duck. Yes indeed it was ready and delicious. Thank you so much and we are on to the next challenge. ps: Any tips on how to slice thinly? Hi Norizan, I put the duck in the freezer for a few minutes and then it sliced thin very easily. I am so excited to jump in… I ordered my book and I know I am behind in the duck but I will catch up as soon as I can. But I am so, so in!!!! I’ve had this book for awhile and only made a few things from it. Now I have an extra push to use it more often! I’m in. I’ve finished the duck prosciutto and am looking forward to more. YAY MEAT! I’m really excited about this. Excellent proposition. A mutual reader had your badge on his site and I’m just starting to explore your posts now. We raise pastured pigs here in the mountains of northern Vermont. Winter, our current season, is the challenge. Since we deliver fresh to stores year round we also must farrow year round. Weather like today at -11°F makes it, er, interesting. The latest two litters of piglets, born this past week are doing well and will mature in the easy months of the warm summer. Looking forward to following along with my Culinary Arts students (H.S. level) — we may not be doing these is the proper order, but the students are currently in a week of producing fresh and smoked sausages — all from Ruhlman’s book. Looking forward to the Charcutepalooza challenges in the months to come. Oh wow! I have been wanting to learn more about charcuterie and have this book on my wishlist. I was just looking for someone to do it with and you guys are already curing! So cool. I am definitely in. Just going to order the book today. Okay, I spent some time going over this and I am in. The directions for the challenge were not real clear to me because I am not sure which I am, an apprentise or not. I cook pretty well and have brinded before so I will start with the beef task once my book arrives. Here we go. Hi Michael – You’re welcome to do either challenge. The apprentice challenge will tend to be a little more straightforward, and will be possible to do without a curing chamber or any unusual equipment. The charcutiere challenge will ask you to stretch a little more, may require a curing chamber, and is a little tougher. Hope that helps! Thanks for setting this up, I’m looking forward to seeing what shows up in future months. Since we raise our own pigs, purchase as much food as possible locally – including raw milk, AND since I am a life-long home cook and canner, charcutepalooza should be quite fun. I’ll be participating when I can! I’m so late – but I’d like to be in. Had a love affair with Ruhlman’s Charcuterie four years ago and would have loved to have had the opportunity to figure out the things I did wrong – oh so many (and brag on the ultimate pancetta and jowls that ruined me for all others). Out to get a brisket! I WANNA JOIN! I WANNA JOIN! I WANNA JOIN! If you make T-shirts the tag line should be…Swine is Sweeeeeeeeet! How can anyone seriously think meat is healthy? Or that any slaughter is ‘humane’? Meat is unnecessary, even if you do-it-yourself it is incredibly wasteful of resources and is screwing up the planet. It also promotes violence towards other creatures non-human and otherwise, a great thing for us Mum’s to teach our kids! Real health is a meat-free diet. Read the China Study by Dr. T Colin Campbell and about any other reputable health book that is willing to drop cultural conditioning and look at the facts – meat is bad for you! Here’s to a year of compassion, and vibrant health. I am joining in..late-I am waiting for the book to arrive. I have done some of this before..have made sausages and corned my own beef in the past…I did NOT pay attention to the grinding process so that’s on my agenda…I always wanted to be able to smoke things-my grandfather made his own prosciutto…. I as a rule look for grass fed meats and organic dairy always..so we’ll see what this can lead to…looking forward to this. Here is a link to the t-shirts and great porky swag! Well, if I can still join this late in the day, I’m in. We rear our own pigs and geese and sheep and experiment with charcuterie on a weekly basis. I just wish I had seen this 9 months ago, but I have to confess to being a bit of a luddite when it comes to the interweb. It has taken me a year to work out how to have a blog and I have just spent a fruitless hour trying to insert the Charcutapalooza widget into it. Inserting venison into a galantine is much more my thing. I know it’s late but I’d like to get in on this too! any chance of a Charcutepalooza part deux? You can work your way through the challenges – just click on the charcutepalooza link above. The Charcutepalooza community seems pretty strong – just check in at the #charcutepalooza hashtag on Twitter for advice! In the meantime, I’ve been cooking up a new idea. Details soon. I just blogged about my homemade pate and as I was submitting it to Punk Domestics to share, I learned about what you guys are doing over here! I’m thrilled! Wow! Love this. I order my meat locally every year through nutrafarms Inc. All free range, no hormones etc… I wish I’d seen this earlier! They deliver Ll over Ontario. Happy meat year! How could I miss this blog for so long?! Last week I bought Ruhlman’s book and started searching for variations on some recipes and Charcutelapooza had quite a few hits. Thanks for inspiring me to start curing again! I am lucky that where I live now we have lot of Amish farms so good meat is easy to get. I’m making my first duck prosciutto this week. It’ll use it in my South West French recipes that call for the pork version. Also, the French pronunciation for “charcute” sounds like “sharcroot” with the accent on the second syllable. “Charcuterie” sounds like “sharcootree” with the accent on the third syllable. The “e” in the middle is silent. Thus, “Charcutepalooza” should be pronounced “sharcootpalooza”. Sorry for being so pedantic but there’s no shame in using the right pronunciation, is there? As Rick Perry said, “oops”! I added an R to “sharcoot” that doesn’t belong there. I must have been thinking about the meal I made the other night. Hello – I hope I’m not too late! I would love to enter. We have just hung 100 kilos of sausages & salami in the rafters of our farmhouse in Italy! No Proscuitto for Raccoons! « Roast • Muddle • Rise. Brining Duck « WTF Am I Cooking? Vivek's Epicurean Adventures » Homemade Duck Prosciutto – Another Charcutepalooza Project!